G2VP, a venture capital firm spun out of Kleiner Perkins and focused on green and sustainability-related tech including energy, has closed $350 million in capital, Axios' Kia Kokalitcheva reports. Why it matters: Kleiner Perkins’ investments in green tech were famously a bust, but according to partner Dave Mount, G2VP will focus on the areas that did deliver financial returns — applications of digital tech to sustainability and heavy industry. He cites agricultural data management company Farmers Edge and fleet management software provider Telogis as examples. Backers include Shell: G2VP’s debut fund is backed by family offices, institutional investors, and a number of relevant companies including Shell, Mitsui, and ABB. Kleiner Perkins chairman John Doerr is also an investor. The firm plans to invest in sectors ranging from energy technology to transportation and heavy industry, among others, though it has no specific target size for each category. Be smart: Many of the failures a decade ago came from pouring a lot of money into developing new clean energy technologies, which was more capital and time intensive than expected, Mount tells Axios. In our Expert Voices section, a bipartisan pair of federal energy regulators said that the Transportation Security Administration is not well-suited to regulating the security of interstate natural gas pipelines. The ultimate regulator must have the statutory authority, resources and commitment to implement mandatory standards, as FERC has done for the electric grid for more than a decade. The context: The need to analyze the vulnerability of the gas pipeline system is among the the rationales that the White House is floating as it considers propping up economically struggling coal-fired and nuclear plants, although the commissioners don't get into that topic. What's next: Pipeline security and the potential coal and nuclear aid are both topics that are likely to surface when all five FERC commissioners testify this morning before the Senate Energy and Natural Resources Committee. Axios' Amy Harder reports ... 13 Republican senators, in a letter obtained by Axios, are urging President Trump to get behind an Obama administration-backed plan that they say would create American manufacturing jobs. It would also cut greenhouse gas emissions, but that went unmentioned in their letter to the president. What they want: The lawmakers are asking Trump to seek Senate ratification of the Kigali Amendment to the Montreal Protocol, the effective 1987 treaty to repair the ozone layer. The amendment seeks to phase down out of refrigerants in appliances that are ozone-friendly but emit powerful greenhouse gases, and replace them with substances that don't degrade ozone or warm the earth. Of note: The senators don’t mention "Obama" or "climate change." It's one of the starkest signs of how the Republican Party is willing to support efforts to cut emissions as long as they don’t mention one of these two hyper-polarizing topics. Go deeper: Amy's got more here. New data: The U.S. added 2.5 gigawatts of solar PV capacity in the first quarter of 2018 — that's an increase from the same period a year earlier, but overall 2018 growth is expected to be flat, a new industry report finds. The industry expects to add roughly 10.6 gigawatts this year, the same level as last year, before higher growth in 2019 and later years. Why it matters: The latest quarterly report from the Solar Energy Industries Association and GTM Research shows how the industry is still growing but faces headwinds from newly imposed import tariffs and other forces. The big picture: "Many in the solar industry have framed 2018 as a year of reset after uncertainty from tax reform, Section 201 tariffs, and state-level policy changes caused a shock to the industry’s growth," Greentech Media reports. One level deeper: The report explores the looming effect of import tariffs on solar modules imposed early this year, which will affect big utility-scale projects the most and slow down the growth rate. Near term: "2018 is expected to be somewhat insulated from the impact of the Section 201 tariffs due to developers securing tariff-free module supply from pre-tariff imports, thin-film PV not being subject to tariffs, and some domestic PV production." Long term: "[T]he impacts of these tariffs are significant — several developers have announced project cancelations, and more are in negotiations to restructure their [power purchase agreements] due to the higher costs resulting from the tariffs." Tesla: The company's former safety director, Carlos Ramirez, claims in a lawsuit that the California-based electric car maker fired him for internally raising concerns about the company's failure to report workplace injuries, Gizmodo's Jalopnik reports. Tesla reportedly responded to the suit, stating that Ramirez was fired after receiving an "onslaught of complaints" about his behavior. Why it matters, per Axios' Steve LeVine: Tesla CEO Elon Musk has an optics problem. This latest round of hysterics began with a news report about outsize workplace injuries at Tesla's Fremont plant. Musk claimed he was under attack by fake news. Now we have a former executive claiming he was fired for reporting the same thing internally. China: Per Bloomberg, "China’s push to eradicate smog by using more natural gas is set to get a boost as it pushes ahead with a plan to merge under one company a national pipeline network that would unify transport and investment decisions." Exxon: Via Reuters, "Exxon Mobil Corp is pushing deeper into energy trading, building a global cadre of experienced traders and beefing up risk-management systems to lift profit." Renewables: A Wall Street Journal feature takes stock of growing worldwide investment in renewable power projects, citing International Energy Agency data showing that over half the generating capacity added in recent years has been from wind, solar and other sources. Per WSJ, "In 2016, the latest year for which data is available, about $297 billion was spent on renewables — more than twice the $143 billion spent on new nuclear, coal, gas and fuel oil power plants, according to the IEA." Image contained in the Energy Department Vehicle Technologies Office latest "Fact of the Week" report. 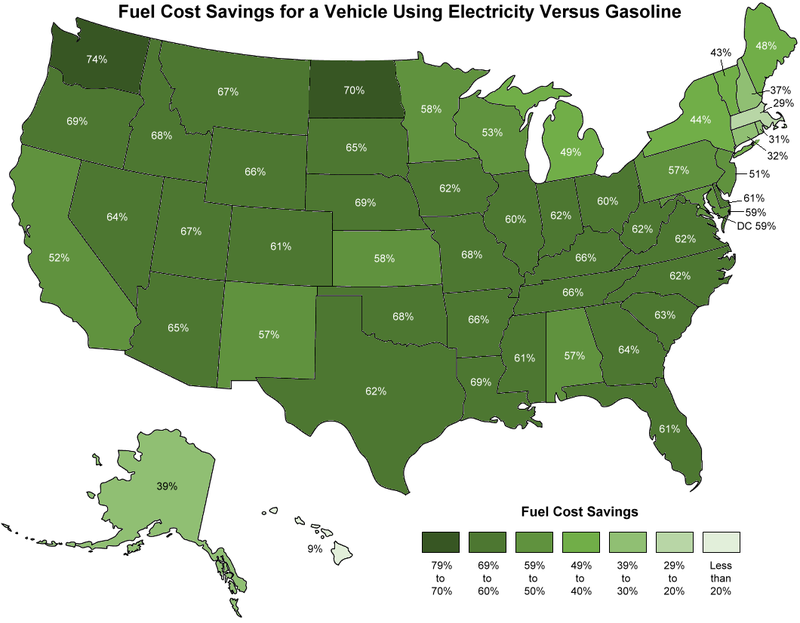 Power vs. fuel: This brief Energy Department report compares energy costs for electric cars and internal combustion vehicles, based on average costs for power and gasoline in various regions and states. Why it matters: It shows that using electricity rather than gasoline for mobility is cheaper nationwide, often much cheaper. However, that's just one consideration for consumers weighing purchase of electric vehicles that are currently just a tiny share of the auto market. Go deeper: Check out our exclusive poll on electric cars showing growth potential despite doubts. In more VC news, Quartz has the news that Breakthrough Energy Ventures, a $1 billion-plus fund launched by Bill Gates and other big investors, is backing a pair energy storage startups with very different technologies. Why it matters: They're the first companies supported by the fund announced in 2016 to back next-wave, climate-friendly energy technologies. 1. Quidnet Energy is a firm that has developed a pumped hydro storage technology that does not rely on rivers or dams, but underground shale rock formations instead. "After water fills up tiny cracks in the rock, forcing more in creates pressure, which compresses shale like a spring. When energy is needed, the pressure is let off and the water that gushes out is used to run turbines that re-generate electricity," their piece notes. 2. Form Energy is a battery company that says it can achieve major cost savings and longer-term storage than traditional lithium-ion batteries. Go deeper: Read more about the energy tech that Bill Gates wants to fund.